In August 1988, Krista McAllister, with a fellow student from the Nova Scotia Agricultural College (Truro NS), spent two weeks on Sable Island studying the horses. During their project they monitored the activities of several family bands on the western quarter of the island. Among the horses studied was Acadian, a bright chestnut stallion with a ginger-red mane and tail. Krista completed her studies at the Atlantic Veterinary College in Charlottetown, Prince Edward Island, and now lives and works in Northern Alberta. Acadian died in 1992. He had been a band stallion for over ten years. While paternity can not be determined based on field observations, it is quite likely that Acadian sired some, if not all, of the many foals born in his group during his tenure. 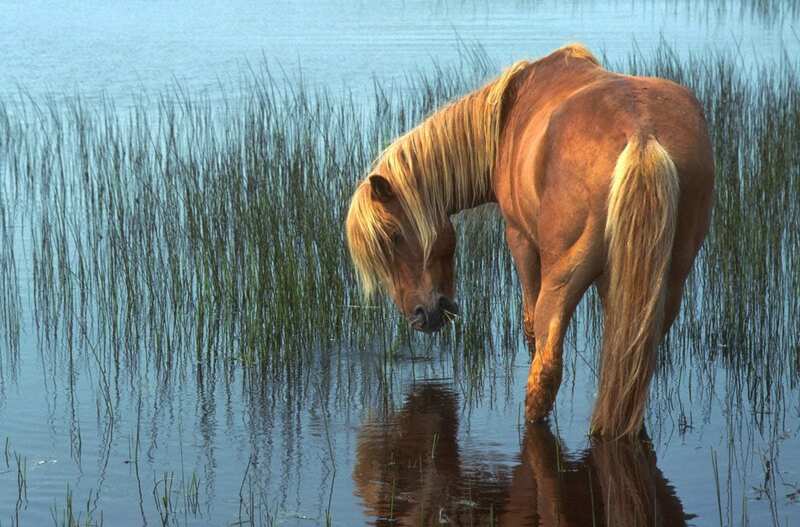 Image above: Sable Island stallion Acadian foraging in a freshwater pond near West Light. Photo Zoe Lucas.